One fifth of the electricity consumption of Swiss buildings is due to electric lighting. Integrated control of sun shading and artificial lighting can mitigate this demand while maintaining user comfort. However, the drawback of existing building control approaches is that they do not consider one of the main aspects of human-centric lighting: visual comfort. The goal of this doctoral thesis is to develop an integrated energy efficient sun shading and electric lighting control system that incorporates widely accepted visual comfort criteria and privileges daylighting over electric lighting. The first part is dedicated to High Dynamic Range (HDR) vision sensor calibration, programing, validation and preliminary testing. 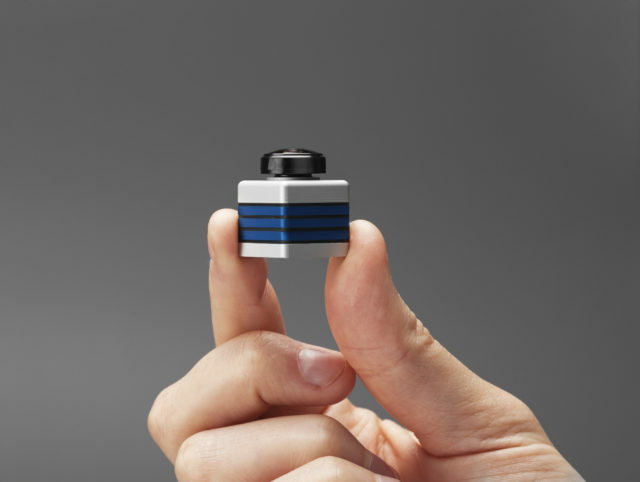 A sensor originally developed by the Centre Suisse d’ Electronique et de Microtechnique (CSEM) was photometrically, spectrally and geometrically calibrated and validated with respect to reliable illuminance and multi-point luminance meters. This HDR vision sensor was then equipped with an embedded image processing routine in order to assess on the flyer discomfort glare indices. It has been demonstrated that the developed device, is able to serve as an enhanced visual comfort feedback sensor in building automation systems. On the other hand, it can be employed to characterize highly glazed facades and workspaces regarding visual comfort and glare risks, as demonstrated in a project in Singapore. Two monitoring campaigns are reported in the second part of this thesis. 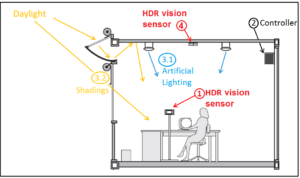 Firstly, 30 human subjects occupied two identical office rooms of the LESO solar experimental building for 15 afternoons to compare the performance of a fuzzy logic control system incorporating two HDR vision sensors with respect to a best-practice controller. 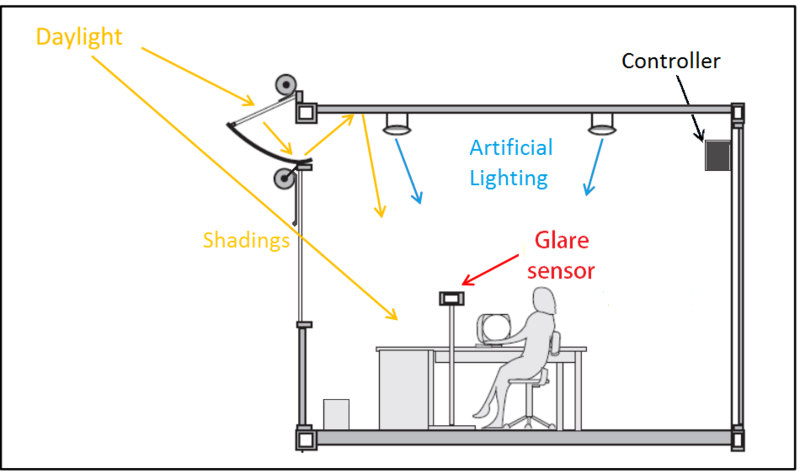 Subjective self-reported visual comfort surveys, paper- and computer-based visual tests and monitoring of the electric lighting consumption were carried out simultaneously in both offices. It was shown that the electricity demand of the office with the advanced controller is 32% lower than that of the reference room, while the subjects visual performance remained comparable. Secondly, an eight-month data monitoring campaign was carried out in the same building in order to study the ability of a novel control approach to maintain optimal visual and thermal comfort conditions while reducing the energy performance gap of a room as well as its electric lighting demand. The experimental results showed that the advanced controller mitigated the performance gap during the heating season by 72% with regard to standard occupant behavior and by 19% with respect to a best-practice automated system. This system reduced backup heating demand leading to lower CO2 gas emissions. 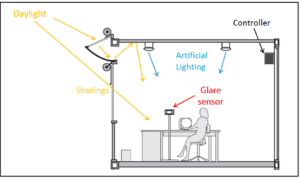 At the same time, visual comfort constraints regarding Daylight Glare Probability (DGP) and workplane horizontal illuminance were respected during work hours. 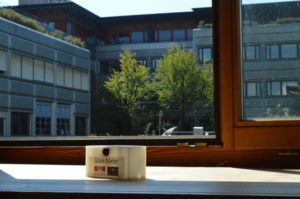 Finally, a self-commissioning integrated controller for Venetian blinds enhanced with a learning module was developed and validated for 22 days in a daylighting testbed at the Fraunhofer Institute for Solar Energy (ISE) in Freiburg, Germany. It has been shown that the visual comfort constraints are respected for 96% of the work hours and that the controller can successfully limit the number of shading movements. 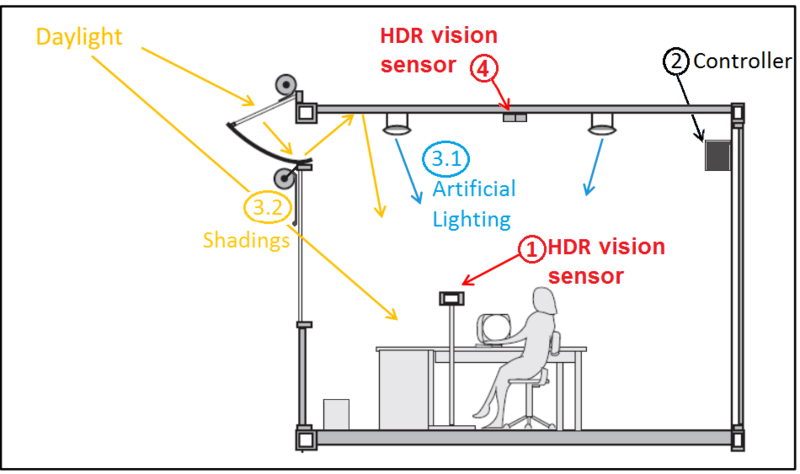 The market potential for HDR vision sensors and integrated control platforms has been studied and possible commercialization tracks have been identified.